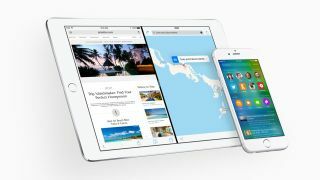 Apple has announced iOS 9 at its WWDC 2015 event in San Francisco. While iOS 8 brought a raft of new features, iOS 9 is more of an incremental offering. There's still a range of features to get our teeth into, so let's see how it differs from the operating system it's replacing. One of the major overhauls in iOS 9 can be found with Siri. She's received a colorful facelift, but it's what's going on behind the scenes which is more interesting. The new interface displays content in a better way, and Siri can now understand a wider range of requests on top of what was on offer in iOS 8. We were shown a number of examples during the keynote, including "show me my photos from Utah last August", "remind me to grab my coffee off the roof when I get in my car" and "play the top songs from 1982" via Apple Music. Siri has been, until now, a reactive service and in iOS 8 you have to prompt your personal assistant. That's changed in iOS 9 with Apple making her a proactive assistant. What does this mean? In short, it's Apple's answer to Google Now with context sensitive information based on time, date and location. It can, for example, intelligently recognize when you get to the gym and plug in your headphones you'll want your workout mix, and display it on your lock screen. Apple's Spotlight Search on iPhone and iPad also benefits from the new and improved Siri, with app suggestions, keys contacts and other location and time specific info displayed on the main search page when you swipe left from your home screen. You'll also spot videos in your search results, something which isn't available on iOS 8, which you can play without leaving the search screen. Unsurprisingly Apple Pay has been given a boost with iOS 9, but a word of warning - it's still only supported on the iPhone 6 and 6 Plus (plus the Apple Watch). Apple Pay on iOS 8 is compatible with a handful of US bank cards, but that support gets extended with iOS 9 to more providers including Discover, plus the service rolls out to users in the UK too. With iOS 9 you can also add store credit and debit cards, plus loyalty and reward cards too. These are stored in "Wallet", the new name for "Passbook" in iOS 9.